These were perfectly wonderful!! The texture, the taste, everything. Well, everything except I only made 12 of them. Next time, I'm doubling the recipe. In a separate bowl, beat the eggs. Stir in melted butter, milk, and vanilla. Add to flour mixture, stirring just until dry ingredients are moistened. Stir in chocolate chips. Spoon batter into muffin cups, filling each about 2/3 full. (I use an ice cream scoop for this! Super easy!!) 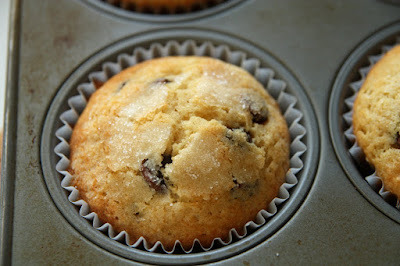 Sprinkle the top of each filled muffin tin with a smidge of sugar. Bake for 20 minutes, or until they are slightly golden on top. I love chocolate chip muffins! I confess, I usually use the mix in the bags to make them quicker but I would love to use this recipe one morning. Thanks! 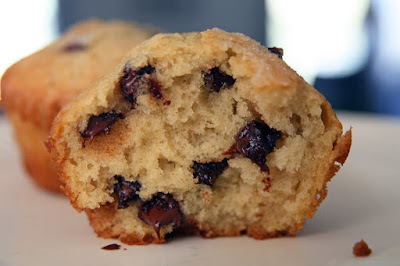 Confession: I have never made a chocolate chip muffin. I think I will have to try these! Thank you for sharing the recipe. Ack! Those look so yummy! I'm saving the recipe for sometime later though! Too much sugar recently! Okay that... just makes me hungry... Muffins are my biggest weakness! I made these sometimes and agree that they are perfectly wonderful! Oh, how delicious they look! Thank you for sharing!